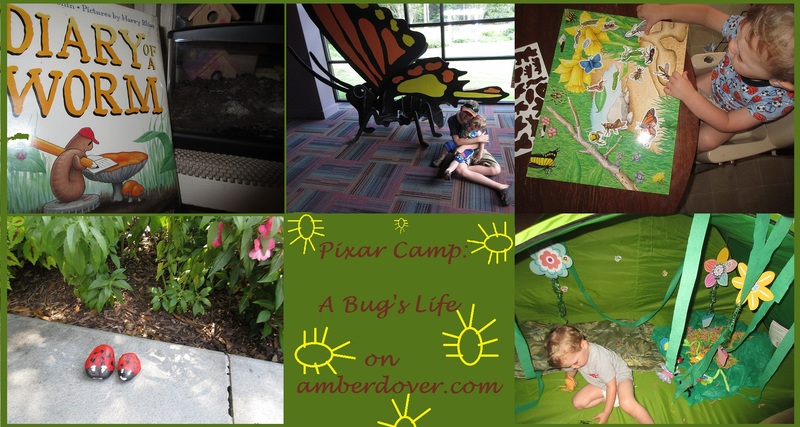 In this post: My sixth Pixar Camp post. Bug themed food and fun! Hello, dear ones! I hope you’re having a lovely day! Just a few more Pixar posts left and we can move on to Back to School fun. I’m not sure which was better, Pixar Camp or Disney Camp (AKA Countdown to Disney). If the Lord tarries, what theme should we do next Summer? I’d love to hear your ideas. A Bug’s Life came out when I was 13 years old (1998)! Wow! So it was fun to share the movie with my boys. I’m leaving a quirky video by the Super Carlin Brothers about Antz vs A Bug’s Life, at the end of this post. The adults may enjoy it. I definitely liked A Bug’s Life better. Antz was not kid friendly to me. James and the Giant Peach is another fun bug movie to watch with the kids. We did a craft for it awhile back. Anywho, here’s how our week went. I’ve thrown in a couple of ideas from Spring too! The Butterfly Center at Callaway- The family and I took a day trip to Callaway Gardens. There’s so much to do there, but I’m only showing you the bug related events. The other pics will come another time, Lord willing. One of our favorite areas is the Butterfly Center. Here are Leeland and Chris watching butterflies break out of their chrysalises. It was very humid inside the butterfly dome. Leeland was amazed by all of the butterflies. Sometimes they will land right on you! The boys each got a treat from the gift shop. Leeland got a Butter Flutter (mechanical butterfly) and Michael got a necklace with a real scorpion inside. Spring Puzzle with Bugs– I believe I bought this at Walmart during Easter. If not, then it was Toys R Us. The mechanical butterfly (Butter Flutter) was a hit! Peg doll bugs- Remember these Spring peg dolls I made? If not, that’s okay. It was 2012 after all. They would make a great craft for A Bug’s Life. I couldn’t find them but I did break out my flower fairies and they are kind of like bugs ;). Pastel Resist Bug Painting- I drew the bugs with crayons and Leeland used water paints over them. I love using this method. The crayons resist the paint and thus the picture shows through! Painting Lady Bug Rocks– I don’t know if you’ve gotten into the trend yet, but recently our community has started hiding painted rocks. They are everywhere…except when we look. But apparently, you can find them in all kinds of public places. We found one in the woods of the park. The rule is to replace the rock with one you make (or you can rehide what you find). I’ll admit we kept our first rock. So Leeland and I made mommy and baby lady bug rocks. We left our sweet treasures in downtown. I hope we put a smile on someone’s face. Bug Park- The park isn’t actually called Bug Park, but we call it that. The playground has bug and leaf shapes. You feel like you are the size of a bug. The Diary of a Worm and Earthworm Fun!- We read a couple of Bug bugs. My favorite was The Diary of a Worm. Chris and Michael had leftover worms from fishing. We decided to observe them. The earthworms only lived a night and then they made a big stink. I guess our dirt wasn’t good enough for them. Bug Play Area- So we have this great pop up tent we use for shade at the beach. I hung strips of green crepe paper and flower party decorations from the top. Then I filled the tent with green and pink paper grass, plastic bugs, and stuffed flowers. I bought all of it at Dollar Tree except what I already had. Of course, we watched A Bug’s Life. Here’s a picture from Spring, when Leeland first got the stuffed flower toys and a big plastic bee. Oxbow Meadows– We did this earlier in the Summer but I wanted to show off the bugs we found. The giant ant reminded me of the old Honey, I Shrunk the Kids play area that used to be at Disney. This spider may give you nightmares! Dirt Pudding- Another spring picture. We had dirt pudding for Chris’ birthday and it would make a great bug dessert. Michael was six when we did this unit by Danielle’s Place. It has scripture and tons of bug facts. Look how small my eldest was! This blog has grown up with him. Next Next post: The End?